As your heirloom tomato plants grow like crazy this summer, you desperately try to find new ways to use all the fruit. Take advantage of this deliciously simple and simply delicious Parties That Cook recipe. A refreshing twist on the classic Caprese salad, it’s sure to keep your tastes buds happy… not to mention use up a few more of those ripe tomatoes. Once you’ve checked this recipe off the list, check out our recent cookbook club blog for more tomato recipe ideas. Tamales, Tamales, Tamales! This July, Parties That Cook is featuring delectable and delicious Tamales filled with Black Beans and Jack Cheese as our recipe of the month! Not only is this one of our favorite summer recipes, but these surprisingly mild bites can be found on menus at our San Francisco Cooking classes. Honestly, the first time I saw a tamale, I thought I was supposed to eat the corn husk as well. Regrettably, this misconception kept me from the ranks of tamale lovers for a few years. Fast-forward to the present, where I know NOT to eat the husk, and I can’t get enough of these delicious masa creations. Seriously, it’s like opening a little present every time you unwrap one. Who know’s what is inside that corn husk?! It could be piquant pork, savory chicken, or a tasty vegetarian variety. All are scrumptious. If they come with a thick red or green chile sauce (I’m not picky), even better! Though it does take some time to make this party fiesta food, the tasty results are worth every minute! If you have some time to create an exceptional dish, try your hand at this delicious tamale recipe and let us know how it worked for you! Similar recipes can be found in our Appetizer Recipe Library. Prepare Husks: Place husks into a bowl of very hot water and let soak for at least 20 minutes, or until the husk become somewhat translucent. Separate leaves and place back into the water until tender and pliable. Rinse each husk and check to remove any corn silk. Stand husks upright in colander to drain before applying the masa. Make Masa: Mix dry harina masa with hot water until it forms a thick paste (like a dough ball). Put shortening, salt and baking powder in a food processor and pulse until fluffy. Add 1/3 of the masa mixture and pulse to combine. Repeat with the next two thirds, in two separate batches. Scrape down the sides then process. Add the vegetable stock, in a slow stream. Make Filling: Roast the chilies over an open flame until blackened. Transfer to a bowl and cover with plastic to let steam for 3 minutes. Peel off the charred outer skin and remove the stem and seeds. Dice into small cubes. Combine beans and cumin, salt and pepper. Mash slightly. Grate the cheese. 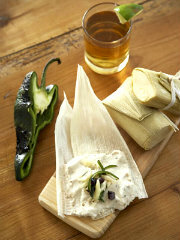 Assemble Tamales: Spread each corn husk flat on a cutting board, with the pointed end away from you. With a small spoon, spread 1-2 Tablespoons of masa over the bottom 2/3 of the husk. Place 1 Tablespoon of the filling in the center and fold the sides over to cover the filling. Fold over the top half (pointed end) of the husk to seal. Use ribbon of the husk to tie up the tamale or just place the folded side down in a steamer. Repeat the process with remaining husks. Steam Tamales: Steam tamales in steamer basket for 20 minutes, or until the masa easily pulls away from the husk. Serve: Let cool for 5 minutes and arrange on a serving platter.